The first thing one needs is information. Understanding and Managing Vision Deficits-A Guide for Occupational Therapists would be a wise investment. Dr. Scheiman’s book explains assessing and treating basic binocular vision defects making the subject approachable for therapists. He also teaches a course by the same name that would be a good start. The Convergence Insufficiency Treatment Trial Manual’s Chapter 8 explains the in-clinic activities used in the CITT and would also be a worth while read. This may be the hardest thing to find. While the complete binocular vision assessment is the standard of care, frequently this assessment is neglected. Find the optometrist in your community that consistently performs these assessments and you will most likely find a partner. COVD and NORA doctors may be most receptive to working with a physical or occupational therapist that is training in binocular vision disorders. The optometrist diagnosis is as important as the diagnosis a therapist would get before starting rehab on a shoulder. While we can perform basic testing on a shoulder, some results would indicate further assessment by the orthopedist. Same rules would apply concerning eye movements except that even poor tracking could be caused by a lack of visual acuity requiring glasses . 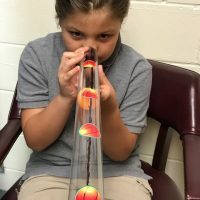 Always insist that a child have a current eye exam before working on eye movement or even skills like visual motor integration or visual perception. Performance of these tasks requires best corrected visual acuity. The Worth 4 dot would be a wise first investment. With models starting at about $20, it it also very cost effective and gives great first clues to a eye movement problem. Marsden Balls offer an easy to use moving target that requires good fixation to read letters. The handy therapist could probably make one on their own. The Hart Chart is simple way to strengthen accommodation. Do it on a balance board and add in the challenge of balance. The brock string is a must and its cousin the barrel card can be used to strengthen convergence. Have the patient make their own brock string becomes a great fine motor activity too. The Developmental Eye Movement Test is quick to give assessment that gives good data to reading ability and accuracy. The rules governing the use of prism and lenses vary greatly from state to state with the interpretation of the rules varying. Because of this, the author has chosen not to openly recommend these tools. They would generally require being under the supervision of an optometrist or ophthalmologist for there use and purchase. They also require training to understand the appropriate therapeutic use of these tools. The near-far axis is generally referred to as the Z-axis. When we turn our midline crossing tasks into the Z axis, we are now working the near far visual system. Check out a previous post here. Be creative and have fun. 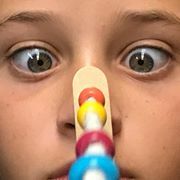 This entry was posted in occupational therapy, pediatric, vision rehabilitation and tagged accommodation, convergence, convergence insufficiency, EOM assessment, eye movements, handwriting, occupational therapy, pediatric optometry, read problems, saccade activities, saccades, vision rehabilitation. Bookmark the permalink.